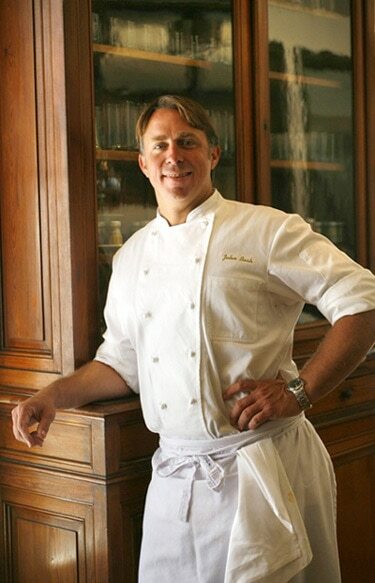 2015 Best Restaurateur in the U.S.
Chef/restaurateur John Besh was born and raised in Southern Louisiana, so he's been familiar with its unique culinary heritage and regional ingredients from a young age. He studied at The Culinary Institute of America in Hyde Park, New York, and spent time in influential kitchens in Europe, where his mentors included chef Karl-Josef Fuchs of Romantik Hotel Spielweg in Münstertal, Germany, and chef Alain Assaud of the eponymous restaurant in Saint-Rémy-de-Provence, France. 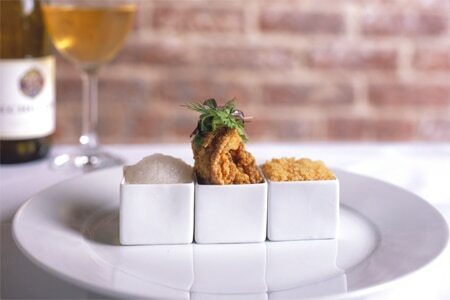 These experiences formed an ideal foundation for his cuisine at his fine dining establishment Restaurant August, which made its debut in New Orleans in 2001. His contemporary French menu puts an haute Creole twist on wild fish and fine boutique meats. Locally sourced ingredients, such as Louisiana caviar, feature prominently. As a testament to his talent, Restaurant August has been honored on GAYOT's Top 40 Restaurants in the U.S. list since 2006. It's also on GAYOT's New Orleans Top 10 lists for highest food ratings, romantic restaurants, best wine lists and special occasion dining. The expansion of his culinary reach started in 2003 with Besh Steak at Harrah's New Orleans. In 2007, he opened Lüke brasserie in New Orleans and picked up the famed La Provence, a French restaurant across Lake Pontchartrain in Lacombe. His growing empire continued with a San Antonio branch of Lüke (2010), seafood-focused Borgne (2011) and Italian spots Domenica (2009) and Pizza Domenica (2014) in New Orleans. Besh's most recent restaurant collaborations explore still more regional cuisines. In 2014, he teamed up with celebrity chef Aarón Sánchez (a judge on the Food Network's show "Chopped") to open Johnny Sanchez, a contemporary taqueria with locations in Baltimore and New Orleans. Besh is also a partner in Shaya in New Orleans, which offers modern Israeli cuisine courtesy of chef Alon Shaya (Domenica, Pizza Domenica). Television appearances on shows such as “Iron Chef America,” “The Next Iron Chef” and “Top Chef Masters” have helped raise Besh's profile. However, even with his busy schedule, he has made an effort to give back to the community. The John Besh Foundation is a non-profit organization that provides scholarships, grants and loans to people looking to preserve and bolster the rich food culture of Louisiana. He also played an active role in helping New Orleans recover from Hurricane Katrina in 2005 and the BP oil spill in the Gulf of Mexico in 2010. On top of it all, Besh has published three tomes, My New Orleans: The Cookbook, My Family Table: A Passionate Plea for Home Cooking and Cooking from the Heart: My Favorite Lessons Learned Along the Way, as well as co-authored New Orleans Program: Eat, Exercise and Enjoy Life. Next is the release of his latest cookbook, Besh Big Easy: 101 Home-Cooked New Orleans Recipes. His aim is to make Southern classics such as jambalaya more accessible for cooks at home, while preserving the bold, complex flavors that have made these dishes so beloved. On a personal note, our experiences with John Besh have been memorable not only for the fine food he creates, but also for his warm and welcoming attitude. He always has a smile on his face. We look forward to seeing what the future holds for this kindhearted chef, restaurateur and champion of the culinary heritage of Southern Louisiana.